TJ Mizell made his debut on this blog last month after he started DJ'ing on the subway in New York City, and immediately won us over with his incredible talent. Now the son of the legendary DJ, Jam Master Jay has done a tribute to his late father alongside DJ Scratch, last month in honour of his birthday. 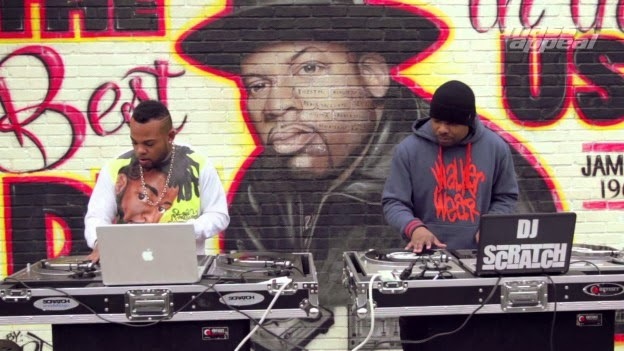 TJ Mizell and renowned DJ Scratch pay homage in front of the Jam Master Jay memorial in Hollis, Queens. The duo pays their respect for the falled legend with a tage team routine showcasing the timeless art of turntablism. Filmed by the good people over at Mass Appeal, watch as TJ Mizell and DJ Scratch live on Jam Master Jay's legacy in this two-minute-clip, which they had originally done in just over an hour.